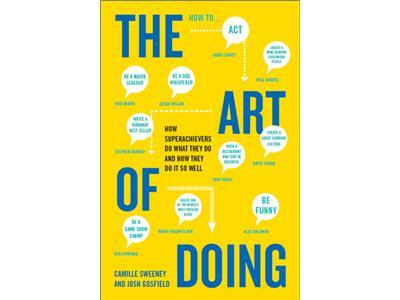 Camille Sweeney & Josh Gosfield set out on a mission to find out what makes the truly successful people of our time tick. What values or principles do they hold that others do not? How do they prepare themselves to do incredible things despite repeatedly being told that they "can't" and they "shouldn't" or "be real." Camille and Josh interview a legendary list of people and found certain characteristics that they all share. Find out what those characteristics are and if you're lacking those necessary qualities. Camille has known she wanted to be a writer since she was 5. She’s written for The New York Times and other publications. She is a MacDowell Arts Colony Fellow and writes fiction in her spare time. Josh has worked on farms and as a carpenter and cartoonist. He was the Art Director of New York Magazine. His illustrations and photos for major magazines, record companies and book publishers have won numerous awards. He has had several one-man shows of paintings in New York and Los Angeles and has art directed music videos and written and directed short films. For his latest fine art project, GIGI, The Black Flower, Josh was both author and creator of a critically acclaimed, multi-media archive of a fictional celebrity. Together (and separately!) they have learned a lot from their collaboration and the superachievers they interviewed for their book.